You can use the NLP (Natural Language Processing) Sample application to analyze the text of email and posts on social media streams such as Facebook, Twitter, and YouTube. By analyzing users' input, you can gain insight that helps you to structure the data in your application to deliver better services to customers and increase your customer base. The NLP Sample application is available as an archive file that you can download and install. It includes a portal, text samples, and taxonomies that you can explore or extend with your own models and text. Installing the NLP Sample application. 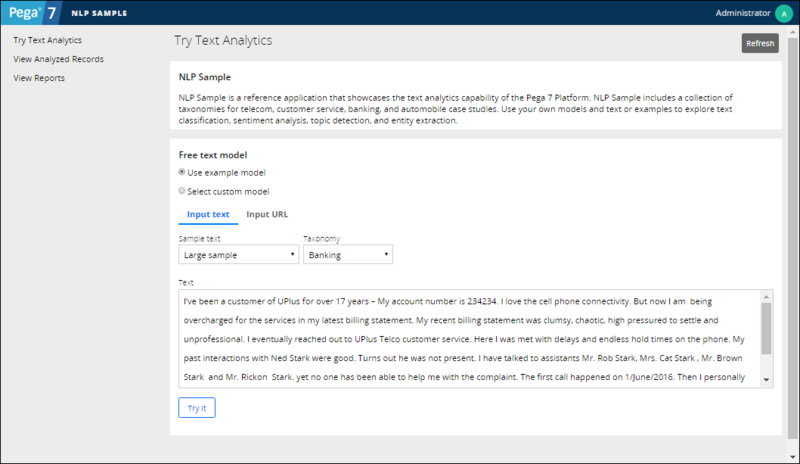 Analyzing text samples in the NLP Sample application. For information about the configuration of the example text analyzer rule, see An example text analyzer in your application. Creating rules that support text analytics of social media data. Viewing and analyzing text analytics data from social media.